Natural beauty, artisanal designs and a reliance on exceptional materials make traditional outdoor furniture popular among consumers who value products with integrity. Influenced by past eras but crafted to last for decades to come, this patio furniture is handcrafted utilizing only the finest lumber, aluminum, steel and wrought iron. These classic-look collections range from regal, European-inspired styles to Americana porch furniture with a wealth of vintage charm. 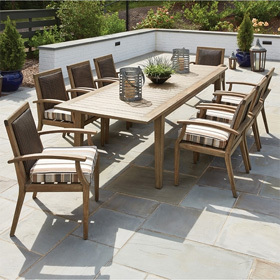 Here, you'll find richly detailed outdoor dining sets that are made for gatherings with friends and family, as well as generously sized patio lounge seating designed to offer the utmost in comfort. While the ageless aesthetic of these styles is instantly appealing, they also boast up-to-date performance thanks to their outdoor-grade cushions and outstanding, all-American construction. Head below to begin exploring our selection of traditional furniture that's built to last for the long haul.